This retreat was rescheduled to allow Latri Nyima Dakpa Rinpoche and Geshe Nyima Kunchap to be at the special ceremonies for His Holiness, the 33rd sMenri Trizin and His Holiness, the 34th sMenri Trizin at sMenri Monastery. The plans are in motion for the “Sacred Red Garuda Retreat”. The purpose of this retreat is to deepen your connection to the Yidam Khyung Mar, experience the serious ceremonial structure under the guidance of our masters, Latri Nyima Dakpa Rinpoche and Geshe Nyima Kunchap. The retreat will have all of the sacred and ceremonial aspects of Yungdrung Bon and the Red Garuda “Khyung Mar”. 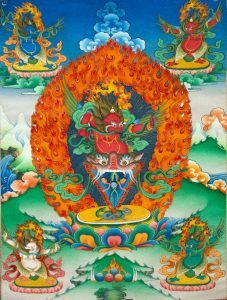 This advanced tantric practice of the Khyung Mar will be taught and lead by Latri Khenpo Nyima Dakpa Rinpoche and assisted by Geshe Nyima Kunchap. They have requested we acknowledge this retreat as a serious sacred advanced retreat. Rinpoche welcomes all who have studied the Red Garuda ~ Khyung Mar, either by his online course, retreats or by other masters and who are genuine and willing to practice for self or healing for others to join us at this retreat. Our masters will teach and guide us in keeping inner experience of Khyung Mar blessing and energy. This Drubpa will be opened with the installment of the Khyung Mar altar, daily Tsok offerings, Phurba, Ta Chen, Chi Tsam and other sacred ceremonial practice. Items will be collected and placed on the alter till the Drubpa is over. Rinpoche encourages everyone attending to have a Phurba, Melong and Thanka at the retreat for a blessing and transfer of the Khyung Mar energy during the retreat. Through this retreat, you will discover the deep mysteries of the Red Garuda. By the end of this retreat, you will be able to close your eyes, hear the call of the Red Garuda, see the Red Garuda and feel the power of the Red Garuda instantly when in need. This practice will take you to a place of greater understanding, where you may be able to unveil the mystery of the Red Garuda, and be even more powerful in your practice. The Red Garuda Teachings. 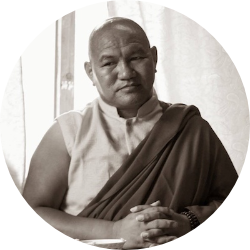 For the past several years, Yeru Bön Center has presented a series of the Red Garuda teachings by Latri Nyima Dakpa Rinpoche. There are over 57 parts of the Khyung Mar Teaching, making this a deep and complex practice. But the reason behind our work to present the progressive teachings of the Red Garuda is purely because this is an amazing practice. A Tantric practice, a powerful healing practice, a daily living practice, and a visual and meditative practice. We started with a weeklong course. This gave rise to a more detailed online course, followed by an advanced Red Garuda Retreat. Then came the powerful Khyung Mar Jinsek Fire Puja of the Red Garuda. We have received letters from students from all over the world, who tell us that because of their Red Garuda Practice they have healed, had surgical procedures without or very little pain, and believe they are free of cancer and other serious illnesses, because of their practice of the Red Garuda. We hope many students will be able to have the same experiences through their Red Garuda studies. Commitment. 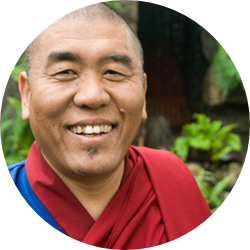 Because of the seriousness of this Red Garuda Retreat, Latri Nyima Dakpa Rinpoche has requested students must attend the entire retreat from beginning to end. This is to maintain the sacred space, continuity of community, and focus of all practitioners. 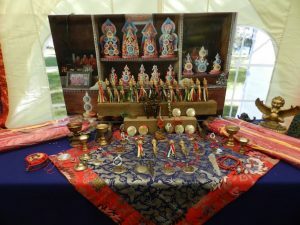 At the end of the retreat all students will receive a special item for your altar, designed for the students attending this retreat, signifying you are a Khyung Mar Nyam Lenpa, Experienced Khyung Mar Practitioner. For the online course click on RED GARUDA for more information. This retreat will be held at the Yeru Retreat Center, located in Emily MN. Peaceful, healing, energizing and the perfect background for this retreat. Two and one-half hours by car from Minneapolis. You can fly into Minneapolis airport, rent a car or sign up for a Yeru Shuttle. Or, you can fly into the Brainerd Lakes Regional Airport (30 minutes from the Retreat Center), and one of our staff will pick you up. Learn more about the Yeru Retreat Center here. Yeru Yurt/Tent – these tents are large 10x10x8. Each tent will have a twin or a double bed. Linen, comforter, table, chair, chandelier lighting. Some will have personal commodes. You will be able to enjoy the sounds and nature of Yeru Retreat and Garauda Lake. We like the tents because they are so private and cozy. You will enjoy! Meals: Meals are included in your fee for the entire retreat. Fresh non-processed meals will be available for everyone. We can accommodate vegetarian and gluten-free diets. Your fee is refundable, less a $75.00 processing fee, if your reservation is cancelled by May 17, 2018; refundable 50% if your reservation is cancelled after May 17, 2018, and non-refundable after August 1, 2018. If you cancel after August 1, 2018, we will apply your payment to another Yeru teaching held within one year. Housing options are limited, early registration or deposit will hold your requested housing. There are local hotels.